If I had it my way, I might eat out at my favorite sushi restaurant 8 days a week. I don’t think I would ever get tired of eating Japanese food, especially in the summer. Luckily the rest of my family loves it as well. My husband and younger son love teriyaki beef and chicken, and gyoza. My older son and I are crazy about sushi rolls, somen and tempura. Somen, which is a very thin wheat noodle (I eat a little wheat/gluten,) is served cold, along side a small bowl of soy sauce broth. The noodles are served family style, as you add small portions of somen to your soy broth at a time, then repeat until it’s all happily in your tummies. It is super duper simple, and so delicious on a hot day. You can add other toppings, vegetables, etc, but that is not how I was introduced to it, and I prefer it plain. A great accompaniment to this would be some tempura… What a fabulous Japanese meal! Ice cold wheat noodles served with a soy broth. In a medium sauce pan, combine soy sauce, mirin and sugar. Heat just to boiling (to melt sugar). Remove from heat and allow to cool. (Place in refrigerator until chilled). 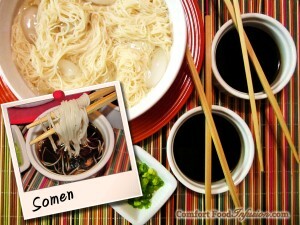 Boil somen according to package directions. Drain somen in collander and rinse well with cold water. In a large serving bowl pour drained, cooled somen. Add to the somen, a cup or so of water, and a couple handfuls of ice cubes. In separate small bowls (about the size of a ramekin) pour about 1/4 cup of the cold soy sauce broth. Serve family style, and add small portions of somen to the soy broth at a time... enjoy, repeat, enjoy!